I am a huge Sophie Kinsella fan and I have read all of her previous books ( as I am sure many of you who follow this blog have to! ), so you can imagine how excited I was when I came home from work last week to a copy of I've Got Your Number which my partner had brought me. Our main character in this book is the lovely Poppy who I loved from the first chapter as she had a very soft and loving feel to her character but also had a great sense of humour which I found similar to Kinsella's previous character Becky. Poppy's relationship with our leading man Sam was great to red as they slowly get to know each other under an unusual circumstance. The book was a real page turner and was such an entertaining light read. I have always found myself chuckling away whilst reading all of Sophie Kinsella's books but I found the humour slightly different in this book, as funny scenarios came from nowhere and so were unexpected and it was also very down to earth humour, with some of the things I could see myself doing including the whole scrabble chapter! There was one thing I was a little unsure of when I first started reading this book and that was the use of footnotes. I found at the beginning having to keep leaving the story to go down to read the footnote was a little of putting and I was worried that this was going to effect the flow of the book but after a couple of chapters the footnotes become less frequent and actually some of them did add to the natural humour of the book it just to a while to get used to them as I have never read a book with so many footnotes in! 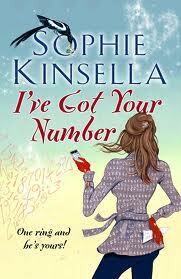 This has to be one of my favourite Sophie Kinsella books. It really is going to be a big seller among chick lit fans. With two great main characters, an easy reading yet unlikely storyline and a bucket full of humour, not forgetting that little splash of romance what more can you ask for? Pure Perfection! I've had this book on my list for a while now, but have not picked it up yet. I keep finding other books instead. But after reading your review I am moving it up on my TBR list! I am so excited to read it and glad you enjoyed it!